I like a good, inspirational underdog story but this one didn’t sit right in my cinema stomach. When Hugh Jackman is one of the weakest parts, you know you have a problem. Let’s get reel and break this down. I appreciated the director’s attention to the ski jumping scenes providing an engrossing, intense experience providing unique camera angles and edited in a slick way. Story: This is a basic underdog story and it’s way too optimistic all the time, border lining cartoony, not exploring the character enough and it seems one dimensional. Tone: With its extremely overcooked optimism, it didn’t work with the few dramatic scenes it did present. They seemed out of place. 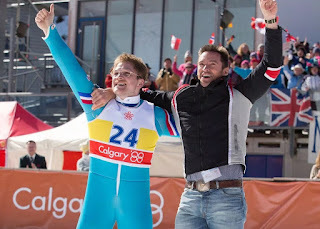 Main Character: I am sure the real-life Eddie Edwards is a great guy and I am sure he was unique in his personality adding a human element to the Olympics; however, the way he is portrayed in the film is a caricature and it wasn’t appealing. And if he was this way in real-life, tone it down a bit for the movie and add more subtlety to the portrayal. 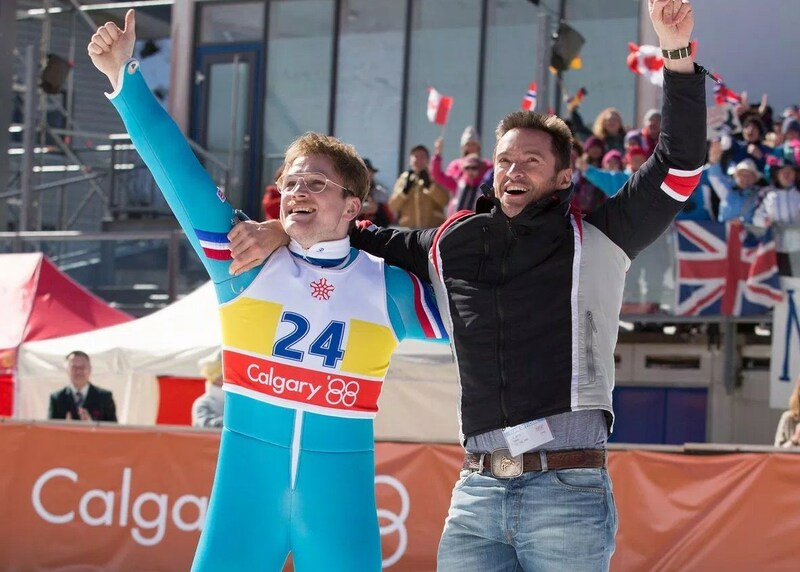 Side Characters: Everyone in this movie was either one-note or underdeveloped, completely pointless and didn’t add anything for the story, or portrayed as a terrible person and always bring Eddie down…even after he made it to the Olympics. The commentators of the Olympics even harped on him, come on, let’s calm that down. Even though I don’t particularly care for the characters, I can’t blame the actors because they were directed that way. Everyone was ok and we get to see Hugh Jackman’s “Oh” face…that was interesting and awkward to see what Wolverine is like in bed. Christopher Walken was pointless being the movie for about two minutes and shoe-horned in at the very end, feeling forced and cheesy beyond belief. The actual ski jumping scenes have some creative angles making the jumpers look like they are floating on air, bringing that effect onto the audience making us feel like we are there. Some of the other scenes were lit very bright (like the optimism of Eddie’s character) but it looked like a set and didn’t have a sense of realism to it. …the humor and tone made the film even slower for me and I just wanted it to be done. The green screen effects were lackluster and looked kind of bad in some shots. I know it sounds like I am tearing this movie apart but there some good aspects about it but I thought they were surround by more bad aspects. If you like underdog stories, I still would recommend this. For me personally, I won’t watch this movie again.